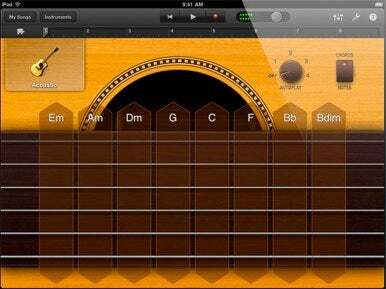 It’s time to don your rockstar sunglasses, because Apple has released GarageBand for the iPad. This new iOS app shares the same name and many similarities of the musically inclined component of Apple’s iLife suite for the Mac. But as you can see from Macworld's first look at the mobile music-making app, this is no port: Apple redesigned and re-imagined GarageBand for the iPad’s multitouch interface. GarageBand for iPad offers a full set of tools to create, record, and edit music, whether you have a deep background in music theory and practice or have never played a lick in your life. You can record sounds with an iPad’s built-in microphone, plug in real instruments with the help of dock adapters, create beats with a drum machine, and loop more than 250 music samples Apple included. If you know your way around an instrument but don’t have one handy, you can use a variety of virtual Touch Instruments like a keyboard, a drum set, and a synthesizer. These instruments even respond like the real thing, playing louder or softer sounds depending on how hard you tap, thanks to the iPad’s built-in accelerometer. For those who could use some help when channeling their musical muse, GarageBand for iPad’s Smart Instruments enable anyone to play music. The Smart Guitar, for example, allows you to strum or fingerpick guitar chords with a tap or two, and it lays out chord progressions that sound great together for easy virtual strumming and picking. A Smart Keyboard, Smart Bass, and Smart Drums mean you can assemble your own private band on your iPad without having to shell out all that cold, hard cash for cold, hard instruments. If you’re ready to start recording your next living room hit or YouTube soundtrack, GarageBand for iPad offers a feature-packed eight-track mixer for recording. You can arrange and edit each of your instruments with a simple, powerful interface that harkens back to the app’s big brother on the Mac, and apply multiple effects to get the right ambient, fun, or edgy sound you’re looking for. When it’s time to go gold master with your new iPad-recorded masterpiece, you can e-mail a copy of your song, export the track to iTunes, or even move the project to your Mac to finish with GarageBand ’11. GarageBand for iPad is available now in the App Store for $5. You’ll need either a first- or second-generation iPad with iOS 4.2 to start rocking out.